Digital downloading jukeboxes appeal to all audiences creating an exceptional, interactive music experience that will keep them coming back. Digital music provides the best music selection from the most reliable network. AMI is considered the ultimate source for out of home entertainment..
With a music catalog offering millions of songs, your locations play list can be custom tailored to your preference. AMI jukeboxes are available in smaller sizes to accommodate your needs. ABC Music Company will analyze your locations requirements and recommend a style of jukebox to accent your decor. 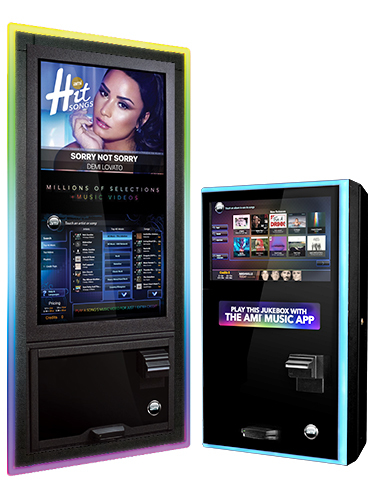 ABC Music offers AMI Jukeboxes to fit your locations needs.